Asset Database - Fastmarkets RISI - Objective Insight. Better Decisions. Make stronger, more strategic sales and marketing decisions by better understanding what’s happening in mills across global markets. Stay abreast of changes in the competitive landscape with detailed and current mill equipment, input consumption and project data. Quickly and easily customize, save and export the information you need to identify new business opportunities and threats from competition with this easy-to-use, intuitive platform. 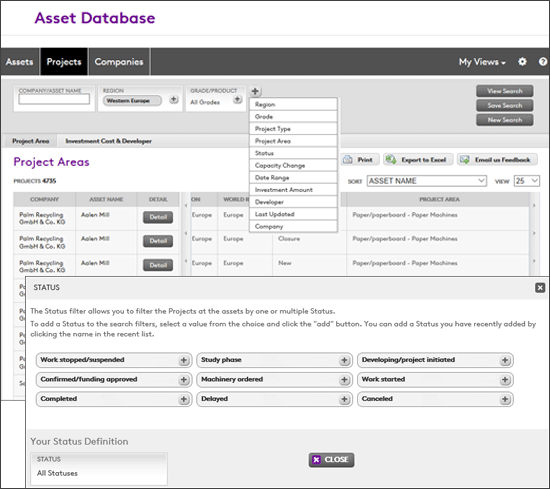 Contact us for pricing information and a walk-through of the Asset Database. Track worldwide mill projects and investments to identify new opportunities and competitive threats. Stay abreast of mill and machine closures, idles and restarts that might impact budgeted sales and pricing. Better understand current market capacity and how that will change as new projects are announced. Evaluate the fiber, furnish, consumption and equipment needs of mills. Access key personnel listings by company and mill to quickly and easily push relevant contact data to your team. 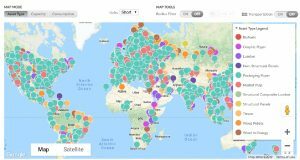 Review financial data for the largest producers in the world. Evaluate wood fiber competition in specific markets to understand how prices will likely move in the future. 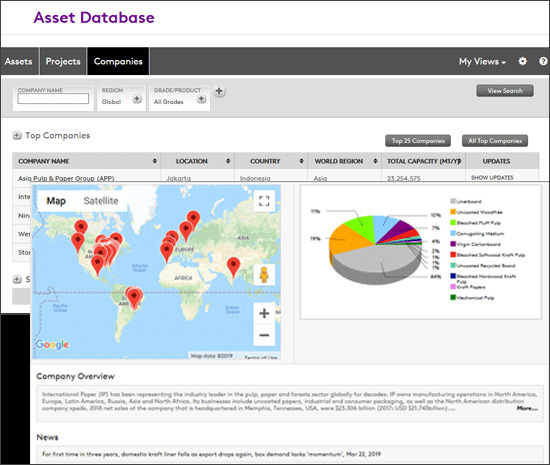 Anticipate changes in the market landscape with continuously updated company, mill and projects data. Research companies and mills to understand their involvement in global projects, which suppliers they’re using and investment amounts. 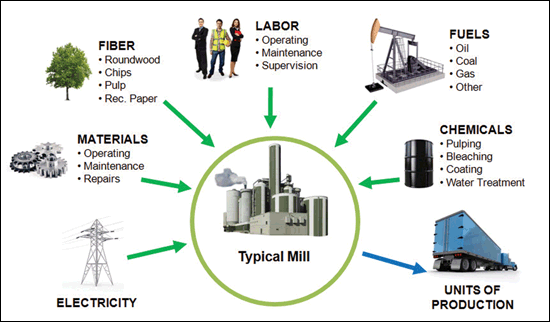 Evaluate mill equipment and manufacturing processes to determine mill strengths and weaknesses. Identify mills and companies using specific types of fiber, furnish, equipment, chemicals and energy. Create maps of mills located in your sales territories that meet specific criteria. 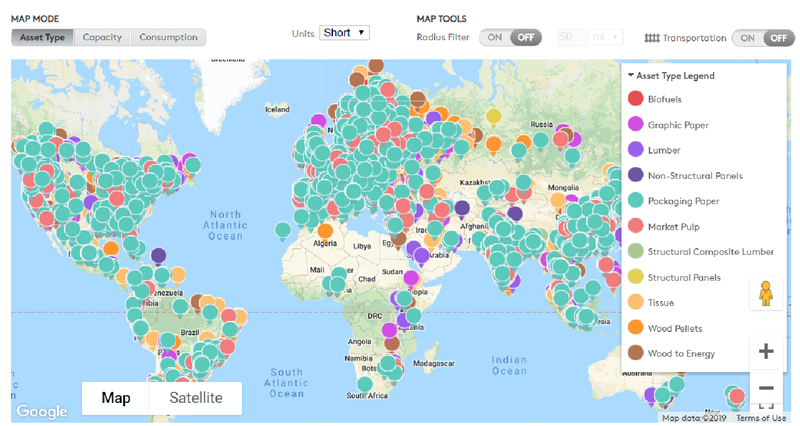 View facilities on the map by what they produce, how much they produce or amount of input consumption. Create a radial search of all facilities located within a defined proximity around a specific location. 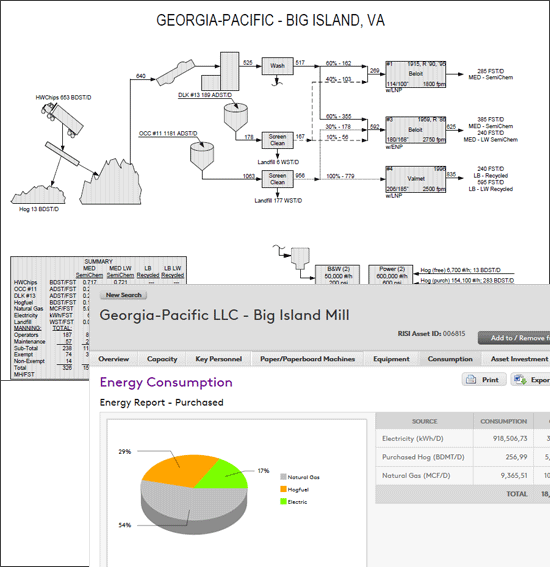 Pull custom mill and key personnel lists using filters such as grade, region, capacity, consumption, equipment type, etc. Quickly export data and images with an intuitive interface. Customize, save and update reports with ease. Attach notes to mill profiles and share them with your colleagues, or create private notes that are visible only to you. 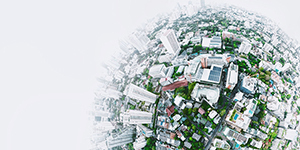 Coverage of over 4,500 companies; over 5,000 pulp, paper and wood products mills; over 1,500 bioenergy facilities; and over 16,500 projects worldwide. Fastmarkets RISI’s mill and facility research methodology is analysis-driven. We don’t simply run a standardized statistical analysis on each facility. We also don’t base our analysis on assumed information or self-reported data. Each facility covered in our database has been independently researched, verified and analyzed by a Fastmarkets RISI engineer. This approach delivers the most accurate asset information available in the forest products industry.